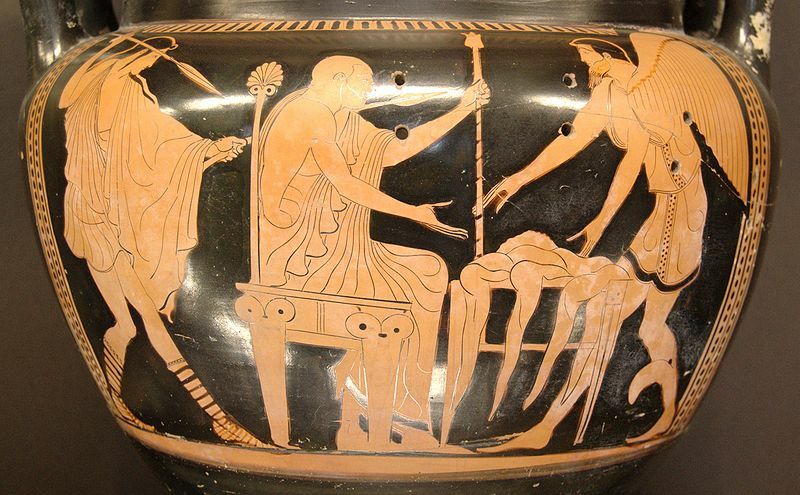 The Boreades rescue Phineus, krater, 460 BCE. CALAIS and ZETES (the Boreadae), in Greek mythology, the winged twin sons of Boreas and Oreithyia. On their arrival with the Argonauts at Salmydessus in Thrace, they liberated their sister Cleopatra, who had been thrown into prison with her two sons by her husband Phineus, the king of the country (Sophocles, Antigone, 966; Diod. Sic. iv. 44). According to another story, they delivered Phineus from the Harpies, in pursuit of whom they perished (Apollodorus i. 9; iii. 15). Others say that they were slain by Heracles near the island of Tenos, in consequence of a quarrel with Tiphys, the pilot of the Argonauts, or because they refused to wait during the search for Hylas, the favourite of Heracles (Hyginus, Fab., 14. 273; schol. on Apollonius Rhodius i. 1304). They were changed by the gods into winds, and the pillars over their tombs in Tenos were said to wave whenever the wind blew from the north. Like the Harpies, Calais and Zetes are obvious personifications of winds. Legend attributed the foundation of Cales in Campania to Calais (Silius Italicus viii. 512).